I heard about oil pulling a few years ago, but I dismissed it as another fad. I do love coconut oil, and I use it for cooking and a lot of my beauty recipes, but I didn't see how swishing it around my mouth could do anything for me. I was wrong. Oh, so wrong. When I was a kid, I had a great dentist. My teeth were fairly healthy, so I didn't have scary dental chair experiences. When I was a teenager in college, I met my first bad dentist. Then I got my wisdom teeth taken out and had a horrible experience. It's been three years, and I still can't feel half of my mouth. I won't scare you with the details, but it really made me fearful of going to the dentist! After a few more dentist issues, I finally found a great dentist. I saw him for two years and then we moved. I found a new dentist here, but I had issues with them and my insurance (they would cover my kids and husband twice a year, but I wasn't covered except for once a year according to them). I finally decided to make the drive to my old dentist, but I couldn't get in for two months. By this time, it had been a little over a year since my last cleaning. Even though I brush and floss religiously, my gums were starting to hurt. I had some pain under my gum in the root area of one tooth. I was terrified that I would need a root canal! When I had to take ibuprofen for the gum pain, I started looking for home remedies for relief until my appointment. Oil pulling kept popping up. So I tried it. I took a little less than half a teaspoon and put it in my mouth. It dissolved fairly quickly, and I swished it around for 5 minutes and spit it in the trash. A few hours later, my gums felt better, but surely it couldn't have been the coconut oil that quickly, right? The pain was back the next morning, so I used coconut oil four times a day for the first few days. Each time, the pain was gone for a few hours. After several days, I was oil pulling just twice a day. Then just in the morning. I was up to 20 minutes by this point. The pain was gone. My gums looked great, and my teeth were a little whiter. Then the former science nerd came out, and I had to see how and why this was working. Turns out, coconut oil can reduce Streptococcus mutans in your mouth. Streptococcus mutans is the leading cause of tooth decay. Coconut oil and also reduce plaque and gingivitis. I usually oil pull while I'm in the shower so the time passes quickly. If I try it while going about my day, it never fails that someone calls or the kids need me to answer a bajillion questions. Place 1 to 2 teaspoons of coconut oil in your mouth. Let melt and gently swish it around, pulling it between your teeth. Swish for 20 minutes. This gives it enough time to kill the bacteria but your body won't have time to reabsorb the bacteria. If you can't swish for 20 minutes, start with 5 minutes and work your way up to 20 minutes. Spit out the coconut oil in the trash. Do not spit it in the sink because it could turn back into a solid and clog your pipes. Rinse with warm water. I usually oil pull before I brush my teeth, so I follow with brushing and mouthwash. When I went to the dentist, I didn't mention that I was oil pulling. I said that I had some pain below my gum, but it was gone. They did x-rays, and everything was fine. Then the hygienist looked at me and asked what I was doing. When I asked her what she meant, she said that my gums were healthier than they had been four years ago, which was the last time I had been in that office. She said that my gums were starting to recede four years prior, but they were actually starting to heal. I just smiled and said, "Coconut oil." She said that she had heard of it, but she hadn't had time to research it. I told her how it kills the bacteria that causes tooth decay, and she was more than a little intrigued. I'm a believer now. I'll definitely be using coconut oil several times a week to keep my teeth healthy. 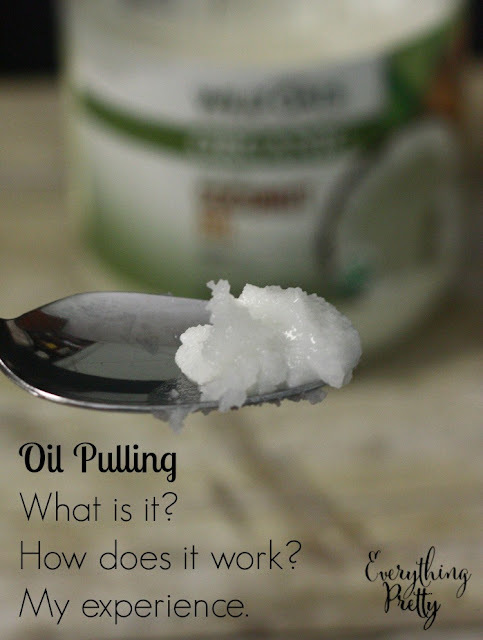 Have you ever tried oil pulling with coconut oil?